I recently ran across this nice summary of the differences between Japanese and Chinese acupuncture. These are general differences. Please realize, though, that there are all types of acupuncturists in Japan, many of whom do a "Chinese" style. And then there are "mixers" like me, who lean toward one approach but incorporate both. In fact I would call my approach "American Eclectic" in that while I am heavily influenced by Kiiko Matsumoto Style acupuncture and more recently Tsuyoshi Shimamura, I also will use Medical acupuncture, Dry Needling (a misnomer by Physical Therapists trying to skirt real acupuncture licensing), and TCM, which is the current most popular form of "Chinese" acupuncture. Oh, let's not forget Master Tung style which is also very interesting! Black beans - TCM Winter Nutrition - Japanese New Year - "Jadou"
There is a concept in Japanese called "Jadou". Dou is more popularly known in English in Chinese as "the Tao", as in the Way. It is the Do(u) in Aikido. Adding "Ja" to this suggests going off the path. Originally it was a Buddhist concept but now more broadly means veering from the conventional way of doing things. I seem to be good at doing/creating "jadou" things. I originally went to Japan spontaneously in my 20s to teach English for a bit. So although I am basically fluent in language and many aspects of culture, I still look through an American lens. This explains my sometimes "unconventional" behavior. My wife usually makes sweet black soybeans for New Year's. The New Year holiday in Japan is our Christmas and Thanksgiving rolled into one. It is a big homecoming and there are a lot of traditional foods either made, or more recently bought. She simmers the beans for many hours with a good quality sugar and a bit of salt. Black beans in the winter are one aspect of Asian Medicine nutrition. Black foods in general are said to "tonify the Kidneys". Winter is a time that stresses the Kidneys (adrenal/hormonal in conventional medicine terms). If you Wikipedia this you'll see that this 2000 year-old idea is likely because of anthocyanin a flavonoid that comes in the colors purple, blue, red, or in this case black. See the wikipedia entry. And as it turns out "The highest recorded amount (of anthocyanin) appears to be specificially in the seed coat of black soybeans ... containing around 2g per 100g,..."
But back to the Jadou... Since we have a huge pot of these beans leftover after New Year's, we often eat them for breakfast. I put them on yogurt which I'm pretty sure isn't conventional. I will assure you though, they are delicious. And the whole dish goes very well with coffee. This is seriously delicious nutrition even if it is a little unconventional! The photo is his new clinic sign. I recently spent 3 days furthering my acupuncture knowledge and clinical skills in Kyushu, one of Japan's largest, southern islands, near a town call Oita. It's near the famous Beppu hot springs which unfortunately I didn't get a chance to visit. Tsuyoshi Shimamura is in his early 40s but has been practicing for over 20 years. He spent a couple of years in Ontario working in his early career. But in the late 90s he spent 3 formative years with Kiyoshi Nagano, a unique and extremely skilled acupuncturist who also influenced Kiiko Matsumoto. Shimamura Sensei is incorporating Japanese orthopedic (soutai) techniques into his acupuncture treatments. The acupuncture aspect focuses on releasing the lower back and pelvis and sacrum as well as the back of the head, occiput area. He was very interested in the intersection of conventional muscles such as the multifidi and erector spinae, deep back muscles, and acupuncture points/meridians. I learned a lot and am applying some of what I learned in my clinic in Montclalir, NJ. 'Go get dad!' The hilarious moment a teenage girl gets her head stuck in a pumpkin during carving session (as her mother stands there filming and laughing). The video is very silly. Mark your calendars: I'll be out of the office from Nov. 15th - Dec 2nd. I'll be studying some acupuncture with a Kiiko Matsumoto- like teacher on the southern island of Kyushu: Tsuyoshi Shimamura. That's Kiiko- Sensei on the left, one of the world's most recognizalbe and unique acupuncturists in terms of style. I was lucky in that she comes frequently to the Eastern School of Acupuncture in Bloomfield, NJ, and has thus influenced my technique the most. 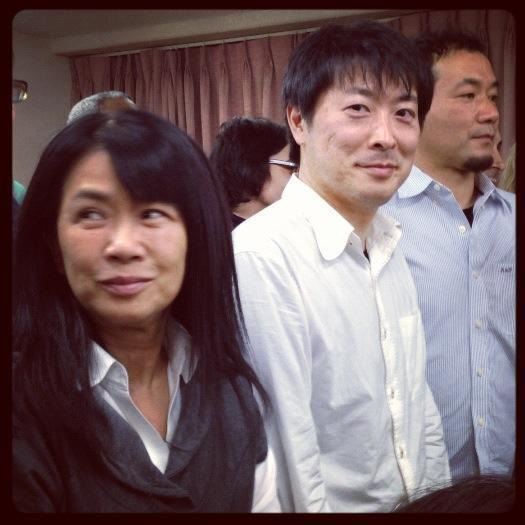 On her left is Shimamura-Sensei. I had the pleasure of studying with him in Osaka with his debut international Japan seminar back in 2013. I'm looking forward to learning new ideas and techniques. I'm still in the office for the next 2 weeks, so if it's time for your Fall tune up, give a call/email.